A person has died following a major car crash on the Trans-Canada Highway near the Nanaimo Airport. 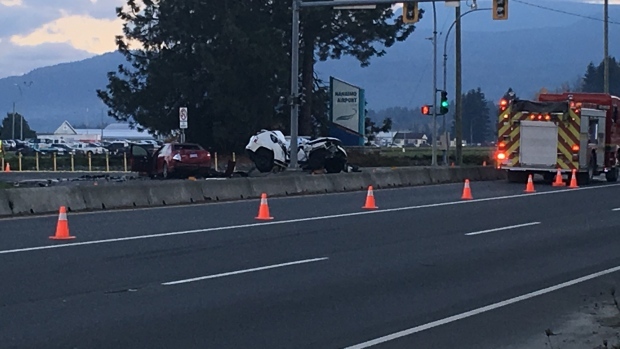 The crash happened on the TCH at Spitfire Road, south of Nanaimo and right at the entrance to the city's airport Monday afternoon. Police say early indications are that a southbound vehicle made a left turn in front of a northbound vehicle, leading to the collision. A white SUV could be seen crumpled around a light standard in the northbound lanes of the highway. There's no word on the condition of others involved in the crash. Police say the investigation is in its early stages and no further information is available at this time. Officers from Ladysmith RCMP, South Vancouver Island Traffic Services and Vancouver Island Collision Analysis and Reconstruction Service were called to investigate. Drive BC said a detour was available to northbound drivers via Cedar Road to Adshead Road. The estimated time of reopening for the highway was 10 p.m.